If you sat through the end of any popular game show on television and noticed the credit rolls, you would have come across a mention similar to format owned by …. Television game shows are usually quiz or activity based, example Kaun Bangea Crorepati adapted from Who wants to be a Millionaire (made famous by Slumdog Millionaire) or Zor Ka Jhatka adapted from Wipeout. Format based shows on a particular television channel during a year are 3 - 4 in number. 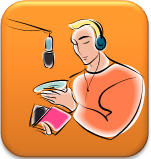 Compare this to radio, tune into a radio channel at any given day part, and you are engaged, interacted and entertained by the Radio Jockey (RJ) talk. It could be a show like Maaro your line in the morning or Kya Bolta Bengaluru in the evening. The creative challenge is to introduce such concepts at regular frequencies to keep the listener interest alive. For radio stations, alacrity is must. Sometimes I wonder if radio stations have thought of documenting these creative formats and publishing them as a book to establish their thought leadership. I have come across the show archives on their websites but not an offline presence. I can picture a book in my mind, titled Popular Radio Listener Engagement Activity formats. Once the listener engagement formats are well documented and articulated, they can be licensed to other radio stations in India or overseas markets. This will not only give an edge to the radio station in the monetization of its knowledge assets vide licensing revenues, but will also establish it as a creative powerhouse. Mention of the wittiest user responses along with the format description will make it an enjoyable read and listen (if accompanied by a CD). It will also give the advertising brands an idea about how the station can creatively weave the brand communication into such engaging activities. Once the book is published, it will also act as an incentive for the users to engage with the radio stations and get a chance to have their names printed in the book. Many television programs and Bollywood movies have done this in the past. BBC Mastermind is one such example. Some of the listener engagement activities on radio can also make a way for team building activities or psychological/psychometric tests in a corporate environment (activities like Are you a workaholic). Cabinet approval for radio licensing and impending slew of new radio stations (Phase III) that will hit the airwaves will further increase the competition, thereby making it vital for existing radio stations to push the creative envelope and listener engagement!